Material wealth, security, high quality services and a good environment are all important for prosperity. But people and relationships matter too. Societies in which people trust one another and where support is freely available, and which have extensive communities and social networks, will be better places to live – and tend to experience higher levels of economic growth. As noted in the 2012 Prosperity Index, this means that the types of values a society holds are intimately related to its level of prosperity. Social Capital can take several forms. In his book, Bowling Alone, Robert Putnam defines two types. The first is ‘bonding’ Social Capital, representing links between like-minded or already affiliated people; and the second is ‘bridging’ Social Capital – referring to links between different groups. High levels of bridging capital are necessary for a smoothly functioning economy, as they represent the level of trust required for institutions and legal systems to prosper. For example, they are central to economic activities such as saving and investing capital, or the levels of civic participation necessary to underpin democratic systems. In contrast, where there are high levels of Social Capital but low levels of ‘bridging capital’, it might suggest that the majority of social ties are between families or other exclusive groups, possibly suggesting cronyism or a society orientated to the needs of a select few. 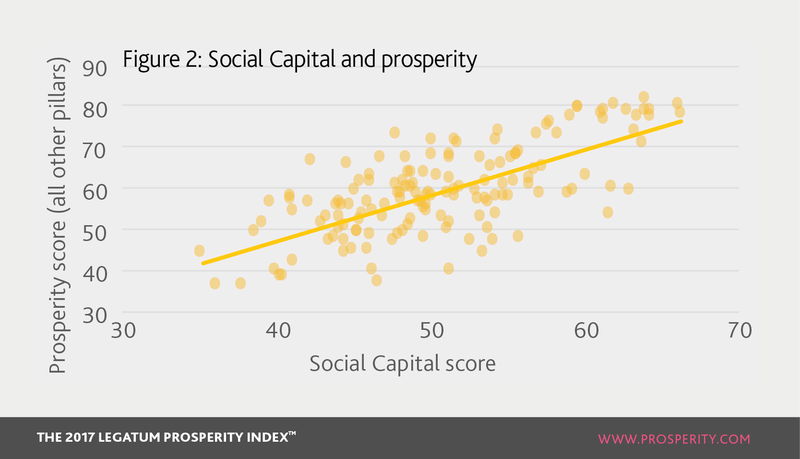 The Prosperity Index captures the level of Social Capital in society across three sub-pillars: a measure of personal and social relationships, an account of the strength of social norms and the level of civic participation in society. As this pillar is necessarily more qualitative than some others, such as economic performance, it is constructed using an assortment of survey questions collected by Gallup. The relationship between Social Capital and prosperity is multifaceted, both generating personal wellbeing for citizens, and contributing to other pillars of prosperity – including the environment in which businesses operate and the governance structures of democratic societies. Such impacts, and the mechanisms through which they take place, are crucial to developing the long-term foundations of prosperity. Aside from the ability to rely on friends or family for support, the other statistically significant influences on prosperity are the levels of trust in police, the levels of donations in society, voter turnout, and the extent to which people feel respected within society. These items involve relationships outside of immediate familial or social circles, and therefore speak to the wider definition of ‘bridging capital’, suggesting its foundational importance to overall levels of prosperity. This can be seen clearly in the relationship between Social Capital and other pillars. 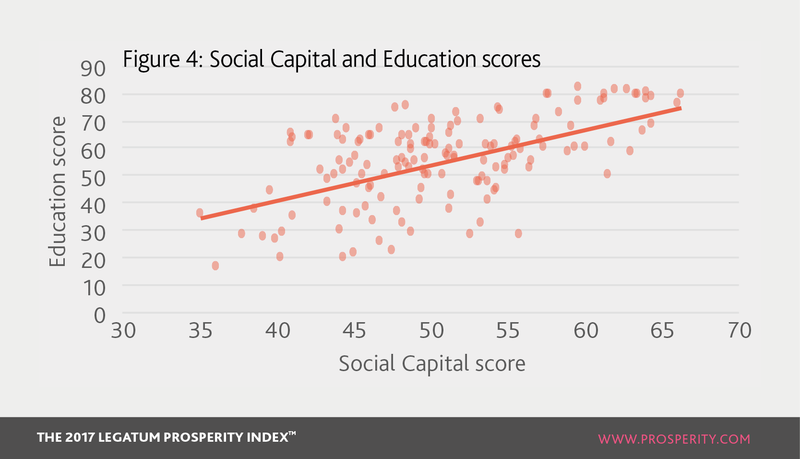 For example, Social Capital correlates with scores in the Governance and Education pillars, suggesting that systems with high levels of Social Capital are also those with institutional strength and higher stocks of human capital (Figures 3 and 4). This would explain the documented links between Social Capital, innovation, and entrepreneurship.2 This has been a consistent relationship over time; in the 2013 edition of the Prosperity Index, we found both that Social Capital was required for innovation to flourish, and that well-governed countries tend to have high levels of Social Capital. These points remain true today. 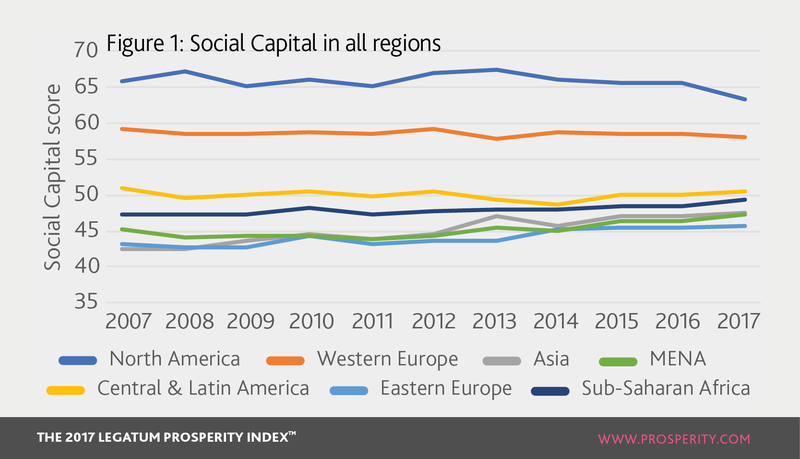 Given the link between Social Capital and Prosperity, it is heartening to see globally that Social Capital was on the rise in 2016-17 – but beneath this figure there are interesting regional trends (Figure 1). Whilst the rest of the world continued a slow pace of increase, the previous year saw sharp dips in the Social Capital of Latin America and a slight fall in Western Europe. In both cases this follows a consistent pattern since 2014-15 and suggests that the world leaders in prosperity may be grappling with new challenges. This impact can be seen clearly in this year’s findings.For example, China’s prosperity is held back by a deficit in Social Capital. This is related to its incomplete economic reforms, which have not yet addressed issues concerning a lack of accountability, higher levels of corruption, and cronyism within some of its state-owned enterprises and parts of local government. Crucially, China’s poor overall performance in Social Capital (ranked 139th) happens despite a 43rd place in the social norms sub-pillar, which incorporates how respected citizens feel and their level of trust in the police. Good performance in these categories is unsurprising given the nature of the Chinese state and society, but poor performances in civic participation and personal and social relationships (148th and 132nd respectively) illustrate a much deeper malaise: people feel safe but do not trust one another. Comparatively, Indonesia ranks 10th in Social Capital, despite an 84th place finish in personal and social relationships. This is primarily due to the fact that other sub-pillars perform strongly, including a first place finish in civic participation, and a 24th place finish in social norms. This demonstrates a wider point — it is not enough for countries to perform well in just one dimension of Social Capital, as China does. What matters is how widespread trust and ‘bridging’ capital is across an entire society. There are several explanations for the decline in Social Capital in the developed Western countries, where it is still highest. In the developed West, large sections of society, especially working and middle class families, have not seen real wages increase for significant periods of time. Many believe that the global economy is rigged against them and consequently have less trust in ordinary societal mechanisms to address their problems. Other factors too may be contributing to these trends, including increased concerns about inequality, and how technology is changing the nature of the workplace, social interaction and political activism. Which of aforementioned challenges is driving the declines in Western Europe and Latin America is unclear, but if they are sustained over the coming years then these regions will have cause to be concerned – especially if it signals a gradual decline in the ‘bridging’ Social Capital, which is so important to prosperity.Some see a result of these challenges as being a backlash against a technocratic elite, which is perceived not to have the interests of the people at heart, with the resulting in populist leaders rising up in the US and in continental Europe. To maintain levels of Social Capital, leadership will have to be shown on issues such as immigration, so as to assuage concerns about safety and economic security and to ensure that a society with common sets of norms and values, and high levels of trust and bridging capital, is sustained. If allowed to erode unchecked, this decline could lead to a situation where people vote but do not believe that their vote has any real impact on the lives which they lead. Indeed, this is already the case for many. 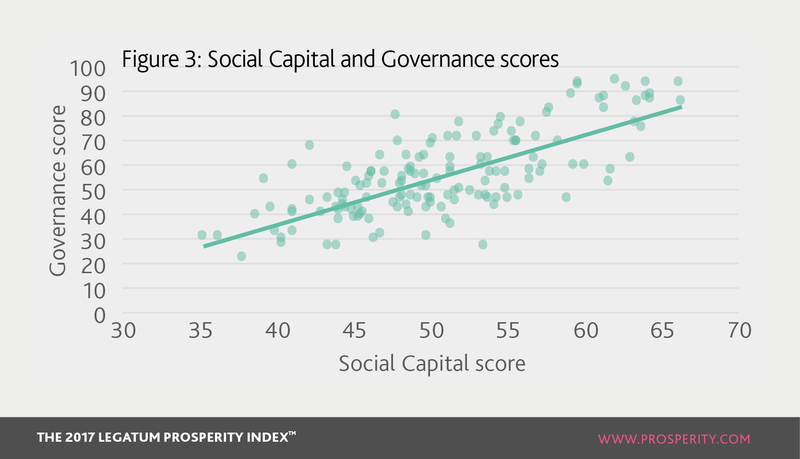 Whilst the story of Social Capital in 2016-17 is one of moderate improvement, performance varies highly both by region and by country. Those countries that are prosperous can rely on Social Capital to contribute to their prosperity by building and strengthening key foundations, primarily through improving trust and lawfulness in society, and providing the guarantees that people need in order to be entrepreneurial, take risks, and place their trust in institutions. Historically, Latin America and Western Europe have led in these areas, but in the past few years they have begun to see stagnation and decline in their Social Capital performances. Identifying the source of this decline and how it can be addressed will be central to sustaining their prosperity in the longer-term; but if these societies see Social Capital decline further and their countries become increasingly polarised, it may then undermine the institutions and economic systems that currently help lead the world in prosperity.